Thank you Susan for highlighting this book. Your reviews always make me curious! Awwww! Thank you so much, Susan! You're such an avid reader that a compliment from you means alot. Thank you!! I read it and totally agree! Great story, and Jessica is an author to be watched. Hi Marja - You're welcome. Curious is good. I hope you'll satisfy that curiosity. Hi Dottie - She did a great job with this story. Hi Jess - What do you have planned next for us? Hi Loree - Thanks for the confirmation. Loved her ending! Can't wait to read this book. It's on my TBR pile as we speak. :) Thanks for the review. Susan, that sounds like a really good read. 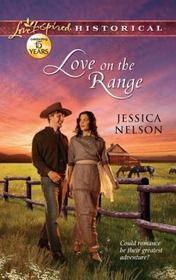 thanks for writing about Love on the Range.